At the Amity/Foran Football Game on Friday night, Offensive Lineman Joey Digello, a Junior, knocked a Foran player to the ground during a play. He then immediately extended a hand and helped that player up and appeared to have a friendly exchange (of words) with him before returning to his position. 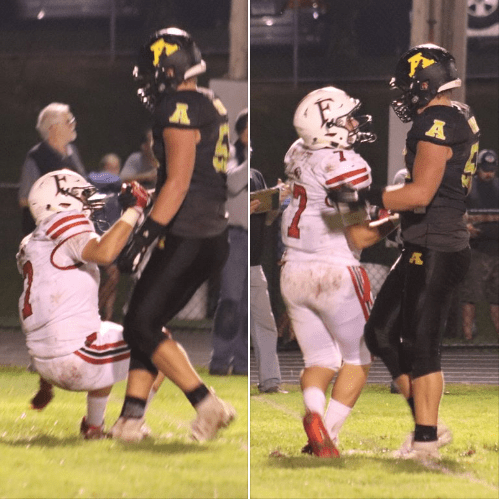 This kind of sportsmanship is what we like to see on the field at Amity, and we applaud Joey for setting a good example for the Pop Warner football players who attended the game. It’s a reflection of good parenting and positive coaching. Excellent job everyone. We’re proud of you Joey D.